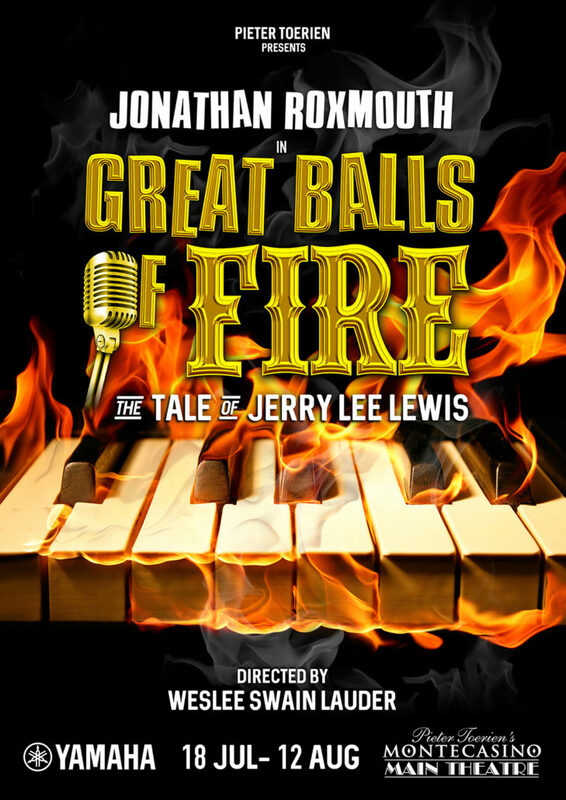 Fresh from his success as Che in the international tour of EVITA, Jonathan Roxmouth sets the stage on fire as Jerry Lee Lewis in GREAT BALLS OF FIRE. Audiences can expect the hits that shaped a generation played by Jonathan at the piano and a flaming hot six piece band. All time favorite hits include GREAT BALLS OF FIRE, WHOLE LOTTA SHAKIN’ GOIN’ ON, ROLL OVER BEETHOVEN and HIGH SCHOOL CONFIDENTIAL. The show features Buddy Holly Stalwart Craig Urbani as Sam Philips and Paul Ditchfield of The Bats as Elmo Lewis. Cranking up the temperature is Ashleigh Butcher (Rock of Ages, The Rocky Horror Show, The Adventures of Peppa Pig) as Myra Gale Lewis. Jerry Lee Lewis is widely regarded as the Real Wild Child of Rock ’n Roll. Since his meteoric rise to fame in the 1950’s, Lewis has established himself as a performer of unbridled energy, passion and unmistakable piano pyrotechnics – literally and musically. Whether driving audiences wild with his distinctive pumping piano style or setting the piano alight, the story of Jerry Lee Lewis is as fascinating as the string of gold records to his name. Having paid tribute to famous pianists like Liberace in CALL ME LEE and Marvin Hamlisch in I’M PLAYING YOUR SONG, Jonathan is back behind the piano for the first time in two years – this time in his favourite genre of rock ’n roll. He once again joins forces with acclaimed director and choreographer WESLEE SWAIN LAUDER -having enjoyed huge success staging Jonathan’s sell out concert THE MUSICALS at the Teatro at Montecasino. The show will be designed by NADINE MINNAAR with lighting by OLIVER HAUSER and sound by RICHARD SMITH. GREAT BALLS OF FIRE opens at Pieter Toerien’s Theatre at Montecasino for a limited 4 week season from 18 July – 12 August. Bookings through Computicket or the Box Office (011) 511 1818.